These are INCREDIBLE. I used the leftovers from the Smashed Potatoes, with just a little bit of flour, these transform into one of my most favorite Italian delicacies. Gnocchi gone bad are just not a good scene, heavy, clumps of dough that stay with you long after you’ve eaten them- THESE WERE NOT THOSE GNOCCHI!. They were light and had the perfect dumpling like texture. I tossed them with a Fresh Tomato Basil Sauce and they only thing that was unfortunate about this meal was that there were ZERO leftovers. In a large bowl, re-smash the potatoes, making sure there are no lumps. 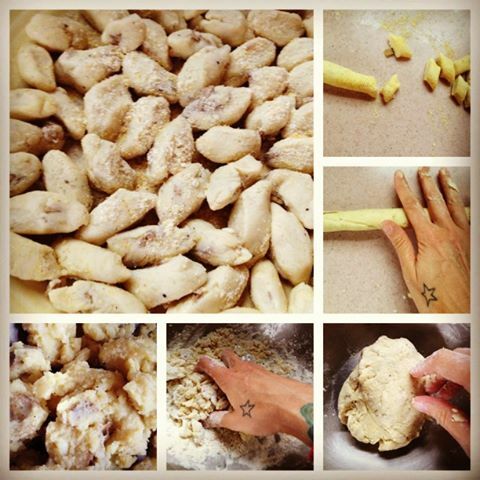 Add the flour, olive oil, salt and pepper into the bowl and with clean hands, form everything into a ball of dough. Turn out the dough onto a clean surface lightly covered in cornmeal. Cut the dough into two. Work one half at a time by rolling it with both hands into a ½” thick rope. With a pastry cutter, cut ½” pieces on the bias. Gently roll each piece and pinch the ends towards each other and place on a plate lightly coated in cornmeal. Do this until all of the dough is used. In batches, drop the gnocchi into heavily salted boiling water and scoop out with a slotted spoon after they rise to the surface. If not using right away, or if you have more than you can eat or you made extra, place the plate of gnocchi in the freezer. Once partially frozen, transfer them into a storage container like a baggie or glass container to keep for a later day. 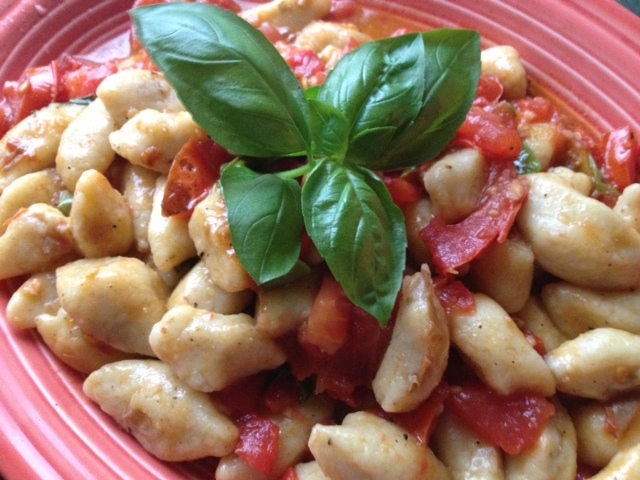 This entry was posted in early fall, fall, late summer, leftovers, mains, pasta and tagged italian, italian vegan love, make it yourself, no eggs, non dairy, potato gnocchi, THE VEGAN LOVE PROJECT, tomato basil, vegan gnocchi, VEGAN LOVE, vegan slow fast food. Bookmark the permalink.